...yeah...what I said about self control. I have a big ambition, that i want a made aeroplane for middle class people. can u help me the basic models and basic design of aeroplanes. I have found two more types I am certain flew before September 1, 1945, the FH-1 Phantom (with one engine and the Bell P-83. ANy resin or vacuform for these two? 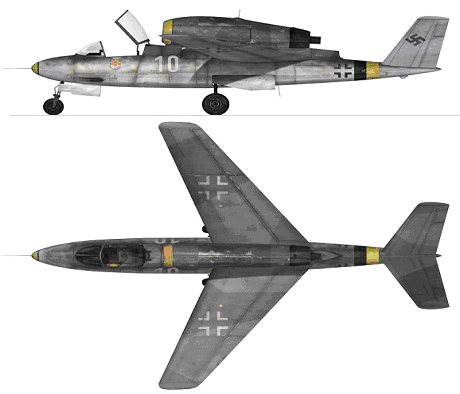 Also I suppose the Dehaviland Vampire prototype requires a lot of cutting from the kits of later variants. Wasn't there a CMK resin kit of the earliest mark? Formaplane did an FH-1. I'd swear I remember an XP-83 from somebody in resin. If not, except for the fuselage, most of the plane is similar to the P-59. I believe Vampire prototype had different vertical tails, more like a trapezoid with two right angles on the trailing edge. The McDonnell FH-1 was kitted by MPM as one of their earlier injected kits. The Bell XP-83 was made by KR vacuforms and is now available in resin by Anigrand. A-HA! The synapses were working correctly. You know why that's unpainted? Because that's as high as the guy could reach with his paint sprayer while standing on the tailcone. :-D I did paint the airflow tufts on it originally, but took them off as they looked goofy. Those engine nacelles in primer suggest that they may have been trouble with the Junkers-Jumo 004 engines at some point in the test program also. Something probably involving fire, shedding turbine blades, or both. At least I did mine in primer; I wonder if they were yellow to identify it as a test aircraft as it didn't have wing markings, at least on top. actually, they just had to change the engines costantly so there were more than one set of covers. they were told to change engines every 5-10 hours running! Anyone want to see a JPG of all of them in the bookcase, I have one. Not a bad assumption...I knew a guy at GE that ran away and joined the Canadian forces (lied about his age) and ended up flying Spits and Typhoons for the RAF during WWII. His unit was in charge of mopping up and securing German airfields after D-Day, and he told me they came across six Me 262s and burnt one of them up on the ground trying figure out how to run the engines on a mix of avgas and tank diesel (there was no fuel on the airfield and the jets were just left behind)...said the throttles were very touchy. They painted roundels on them and everyone in the unit supposedly got to fly one once before the intel folks found out and came and hauled the off...the jets, I mean. Engine gets a bit warm in operation. I wouldn't be surprised if there was a conversion in 1/48 or 1/72, but 1/32 always gets last call. Bet if I start one somebody will put one out. Been there, did that. Fort Duqucaine (I know that's mis-spelt) did one in 1:72 a few years back. It's a pretty little piece. Converted the Hasegawa, IIRC. A Very Good Day Launching Rockets. [Q] V-1 bomb in luft46 designs?